1. Download or export the route you’ve planned and save it as a file on your computer. The preferable format would be Excel, but csv and text will the job as well. 2. Login to your account on MyRouteOnline and click Import Addresses. 3. Select the file you just saved and click Import Now. 4. Once you can view all the stops on the map, click Next. 5. Under Goals tab, change the optimization goal to “Keep Order as is”. 6. This will keep the order of your list, showing the route you’ve imported. 7. Click Save, to save this route on MyRouteOnline. 8. 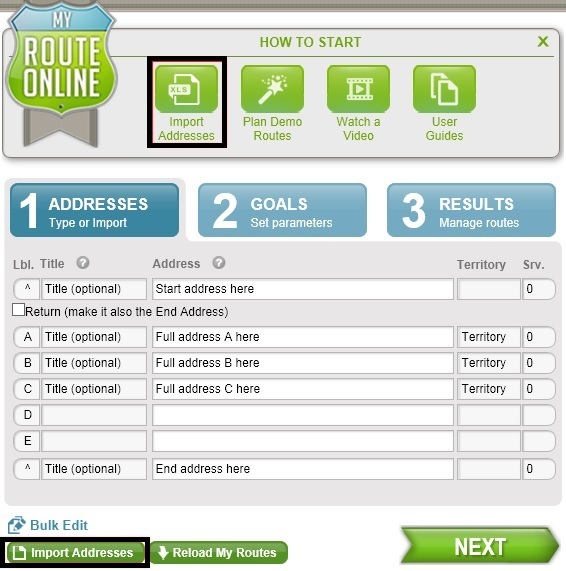 Click Email&App if you wish MyRoute app to assist your navigation.